Ed O'Laughlin is currently ranked No. 18 in the world on the Giants of Backgammon list. He has some very interesting perspectives and insights and strong feelings on several subjects. Ed was highly rated on the KG Rating list for 10 years and even reached the No. 1 spot in 1996. Ed stopped competing in 1995 for a few years. During that time, he spent hours every day playing against the bots and studying the game. 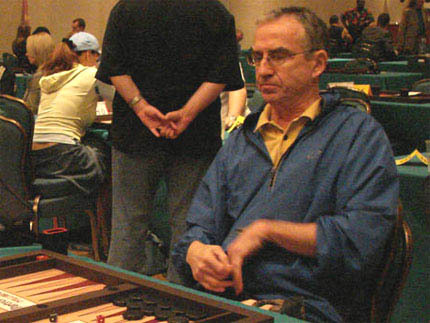 He returned to tournament play in 2000 and cashed in several events. He began traveling to tournaments throughout the US and Europe but now refuses to play in Europe for reasons he will explain below. Ed is turning 72 on January 11th, is married, has two children in their 20's, lives in Central Virginia but plans to move back to Northern Virginia in the near future. I (Phil Simborg) have always had tremendous respect for Ed not only as a player, but as a true gentleman. Several years ago at a major tournament I asked Ed about a position, and he was so knowledgeable and certain that I asked him how he had managed to bring his skills to such a high level. He said that if I was willing to take the time, he would show me. We went up to his room, he opened Gnu Backgammon, and he showed me exactly how to work it and how he practiced on it every day, playing against it and rolling out every position he got wrong or didn't completely understand, and he urged me to do the same. The next day I downloaded Gnu Backgammon and began studying just as he did, and in a matter of weeks it was clear how much my game had improved as a result. Ed is not only a great player, but he is most generous with his knowledge. Can you give us some basic biographical information? I grew up in North Philly. I guess you could say I was a nerd, very much involved in math. I went to Temple University, and became a mathematician (now retired). How did you get introduced to backgammon? In 1979, I was running a chess club when a fellow from Syria asked why I didn't play a really good gamebackgammon. In 1980, I won the blitz in Las Vegas! I got hooked on the game and from then on have devoted all my time to backgammon. I began playing for money, but soon concluded that beating people out of their money was not an ethical way to live my life, so I began playing tournaments exclusively. In 1988 I won the Ceasars Collosus and I have finished 2nd in the Super Jackpot in Vegas five times, and cashed at many tournaments around the world over the years. Do you have any special tips or strategies that you think have really helped your game? I set up challenging positions, like back games and prime vs. prime, and play both sides until I am extremely confident of the cube and checker strategy for both sides. I develop reference positions, roll them out extensively, save them, and study them. I believe reference positions are critical, as what looks to be "logical" over the board is often wrong! For example, one pretty much accepted strategy is to double a back game defender when you threaten to clear the third point in front of them. Through extensive study and rollouts I found this is not necessarily true, and I have different rules to apply at different scores and different pip counts and configurations. I don't think anyone can figure these things out intuitively over the board. This knowledge can only come from experience and study. What's the best backgammon book or article you've ever read? I have great admiration for the writing of Danny Kleinman and would love to see someone create a condensed version of his work containing all of his theories. I have also read and greatly respect the writings of Magriel, Robertie, Trice, Zare, and Woolsey. And I really enjoy reading much of the information on Stick's web site (bgonline.org). The more I study this game the more I realize how little I know, and I am constantly searching for knowledge and strategies to improve my game. I do think I continue to improve, but I'm a little frustrated that I forget some of the reference positions I have studied over the years. What is your favorite tournament or type of game? At tournaments I prefer the Swiss format because it gives you a chance to recover from an unlucky loss or two and is more likely to advance the more skillful players. I also enjoy doubles and have done quite well at it. I agree with Phil and others who advocate playing two out of three shorter matches instead of one long matchthere really is a lot more cube complexity involved when you get to 5-away/5-away and less, and it is more exciting to play and fun to watch. What are some of your pet peeves about tournaments? I have decided to stop playing outside of the United States because, sadly, there are too many cheaters. And the tournament directors and federations have not taken the necessary steps to protect the players from the cheaters and other "bad actors," such as people who bribe their way into major tournaments, people who gamble at the tournaments and don't pay, and people who display extreme poor sportsmanship. I know it is not easy to catch the cheaters red-handed, but many are well-known and can either be banned or monitored very closely. The names of the bad-actors are well-known and some of them have even been caught red-handed, and still they are not banned from tournaments. Over the years, there have been cheaters in the U.S. as well, but the tournament directors have had the good sense and guts to keep them out of the tournaments. Much of the cheating is done with the dice, and I think that use of baffle boxes, dice tubes, and even electronic generators supplied and administered by the tournament staff can pretty much eliminate any concerns in that area. I know people like to roll the dice out of a cup and are used to playing that way, but it's foolish to continue when there is so much risk of being cheated. These tools also help prevent wasting time with cocked dice and throwing dice on the floor. Backgammon needs to keep up with advanced technology and changing times. I am very much in favor of the thrust of the USBGF to promote the game more widely in the U.S. and to be an association that truly represents the players, but I am disappointed that they have not as yet taken a strong stance relative to preventing and banning cheating and other unethical behavior. I know many others share these feelings with me, and I know that you (Phil Simborg) even resigned as Chairman of the Rules and Ethics Committee largely because you could not get board and committee backing on stronger rules and ethics in this area. How would you like to see the game changed? I love the mandatory clock rules, but given the complexity of the game, I believe the current 12 second delay is just a little too restrictive. I'd like to see that moved to 15 seconds. Tell us a little more about your personal life. I continue to study backgammon most of every day and I believe I continue to improve steadily and I think I can be competitive with anyone in the world. I believe it is important to stay in shape physically, and I believe that helps my stamina at tournaments as well. I am a vegetarian and I run and lift weights. I have found a great form of cardio training called Tabata. You do sprint or cycle and other intensive activity for 20 seconds then rest 10 seconds and do this 8 times. A cycle only takes 4 minutes. Aside from backgammon, what are your other hobbies or interests? Any interesting facts about you? My interests outside of backgammon include politics, science, health and sports, and I do a lot of reading and surfing the net on those subjects. I believe in social justice and democratic socialism; I'm against war and any form or discrimination, and I am an atheist and non-conformist. One of my favorite web sites is Counterpunch�it's free and tells the truth. I go to art movies, listen to Nat King Cole and Willie Nelson and love to watch boxing. My plans for the future are to make many tournaments, primarily in the U.S., and to continue honing my backgammon skills. I hope this interview will inspire players to join me in my quest to raise the ethical standards of tournament backgammon as I believe that is needed not only for the protection of the players, but for advancing the reputation of the game in the public's eyes. Thank you to Phil Simborg for sharing this article.